I am about to show you how to make on of my best selling items; a madras zippered pouch. To me, madras is preppy, bright, and southern. Though usually seen in squares of plaid, my madras is made from strips of brightly colored florals and stripes. It is a way to use up the last little bit of your favorite fabrics and make something beautiful. Let's do this! You need lots of bits and pieces of any sort of fabric. You will end up cutting these into 2"x"8 strips and you will need 14 of these strips for the front and back. You will also need two lining pieces (these can be cut from any yardage you like or you can madras the insides as well to really use up your leftovers. It was storming something awful the day I was photographing this and my pictures are lackluster. I promise you won't even mind a bit once you make up your own pouch. How happy are these fabrics? DO NOT OVERTHINK THIS...don't fret about your fabric placements. Just keep it random. I am making up a slew of these for my shop, so I cut a few thousand of these and grouped them in piles of seven (each front or back is made from 7 strips). Once you are well organized and caffeinated, you are ready to assemble your madras. see what I mean about overthinking it? You would never pair these three up, but trust me, the more random, the better! Get some colorful zippers. Don't get these at your craft store if you can help it...go to etsy and pay 1/5 of the price! Sew your strips together seven across. It looks like a mess, doesn't it?! For seam allowance, use the edge of your foot. Now, we are going to make these less messy and give your madras a quilted look. See the seams? Lay them to the side (pick a side. any side) and topstitch the seam. Pinch it to keep it to the side and sew, baby! Topstitching while watching The Office reruns on Netflix. If you are making up 20-30 of these bags at a time like I am, there are a lot of lines to stitch. Can you see the difference between the rows laying neatly on the right and the rows on the left that are still cadywompus? This is why that topstitching is so important. Here is a picture to show how nicely they lay when they are all stitched. The left piece hasn't been "quilted" yet. Let's get the linings done now. Cut out a piece of fabric that is 8"x10". Now, to give your bag some oomph, iron on some fusible stabilizer. I use the lightweight Pellon that they sell by the yard at the fabric store. Your fusible interfacing should be cut to 7"x9". By cutting it a little smaller around each side so that you are not left with bulky seams. 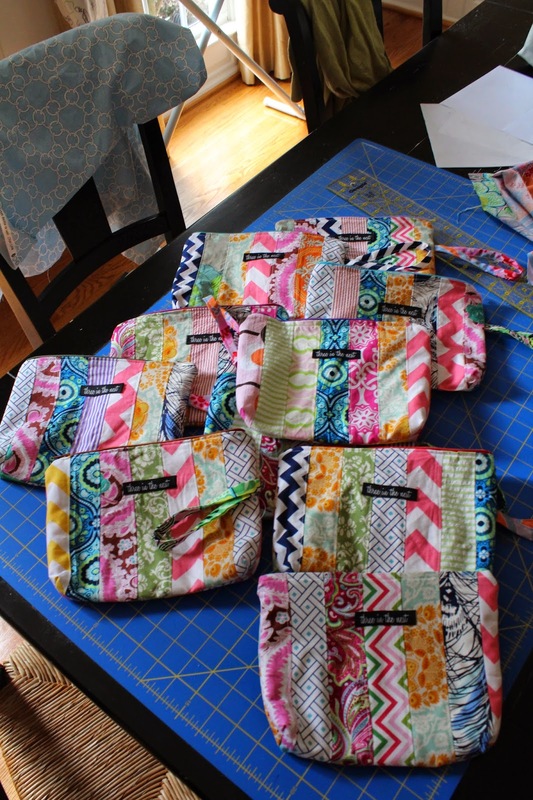 From here on out, nothing new is happening and you can refer to my last zippered pouch tutorial for more in depth instructions. Iron down your front and back by 1/4". Pin your zipper to the top of your lining, and pin the front or back to the other side of this, making a zippered sandwich. 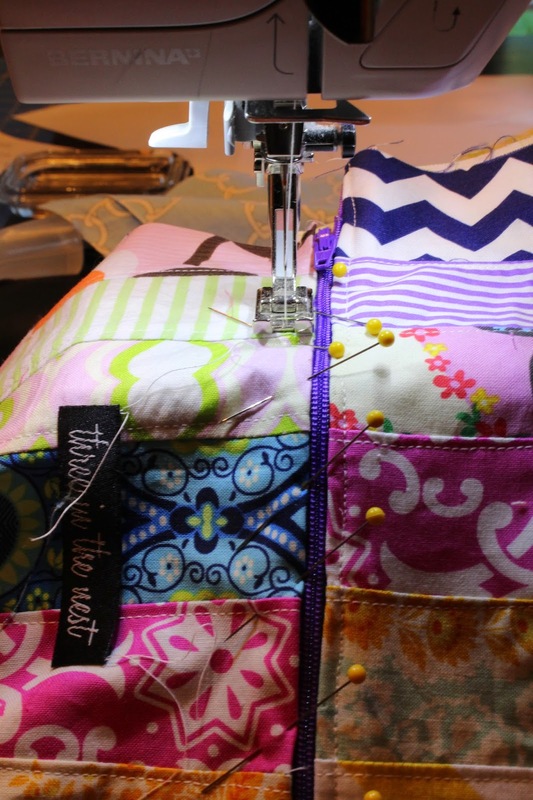 This allows you to attach both the lining and the top to the zipper while topstitching all in one step. Can you see my needle? It is in the far right position. I do this versus using my zipper foot. I'm breaking all the sewing rules. I am a wild thang. Flip it and do it to the other side. What would Michael say here? This is what a stack of madras bags looks like in mid-progress. Join your linings and front and back together with right sides facing each other and sew. WAIT. Open your zipper first. THEN, join these puppies up. 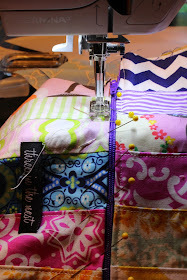 Sew all around the edge of the bag, leaving a three inch gap unsewn for turning right side out. Stitch closed the hole you left. Let's make a handle. Cut a strip of fabric that is 2"x12"
Fold in each side to the middle and iron. Fold that in half and iron again. Whose old lady hands are those? Yikes. Double stitch on either side. It's just prettier that way. With your zipper attached to both sides, fold your strap in half and pin to the side of your madras piece. 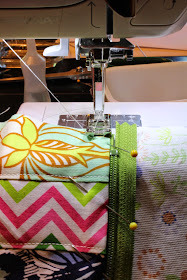 When you join the bag at the lining and front to back with the right sides together, the strap will be sewn into place. You can also baste it into place if you prefer. You can also use one of these fancy~dancy tools to make your strap. Essentially, what you are making is biased tape. Did you make a pretty bag? I made up a few. If you want one, order one! 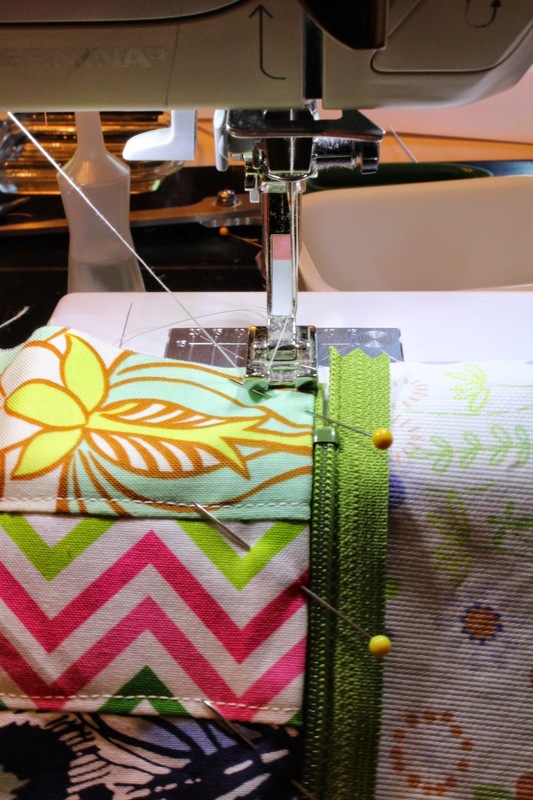 If you sew, make one! I sewed labels on mine for a little extra personality. You can order these on etsy. I think they are presh. Visit our little shop on Facebook to order one or leave your email address here to nab one. If you make one, please email me, as I sure would LOVE to see it and high-five you!